The Kiln dried boule is a cabinet maker’s dream! 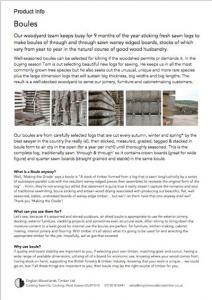 The complete log, sawn through & through, thoroughly seasoned in air drying (for a year per inch!) and then, when dry enough, kilned in tact, to bring down the moisture to a level appropriate for use internally. We keep English & French in kiln dried boules stock in as many species as we can and as many thicknesses as we can. We also cut and source to order for specific requirements.